Pioneer has announced that it will be releasing Platinum Editions of its top of the range pro-DJ gear the CDJ-2000 nexus, DJM-900 nexus and RMX-1000. The limited production CDJ-2000NXS-M, DJM-900NXS-M and RMX-1000-M have been designed to ensure that DJs stand out, with platinum chrome top panels as well as blue and white LEDs giving a stylish reflective surface and premium feel. The CDJ-2000NXS-M also has a platinum chrome jog wheel to complete the metallic look, and every Platinum Edition bears a plate inscribed with its unique limited edition serial number. The CDJ-2000NXS-M player delivers all the features of the industry-standard model, including compatibility with rekordbox DJ software on smartphones and tablets. The DJM-900NXS-M mixer boasts improved audio output and gold-plated terminals for better sound quality and durability. Completing the setup, the RMX-1000-M has an exclusive Platinum Edition GUI for rekordbox and the compatible VST/AU/RTAS plug-ins. 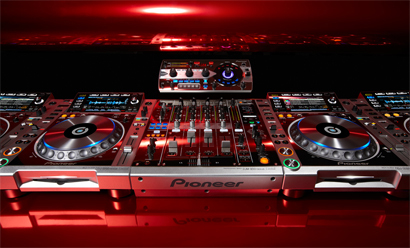 The collection will be available as a complete set – two CDJ-2000NXS-M units, one DJM-900NXS-M, one RMX-1000-M and matching RMX-1000-M stand – from the end of February 2013, with a SSP of £5,999. To complement this exclusive setup, customers will also receive two Pioneer DAS-DGC020 reference grade RCA digital cables with every bundle purchased (one cable per CDJ-2000NXS-M). The production run for these exclusive products will be limited to 4,000 CDJ-2000NXS-M, and 2,000 each of the DJM-900NXS-M and RMX-1000-M, so purchase early to avoid disappointment!